It is always wonderful when rabbis try to make Judaism more relevant to people's daily lives. In today's metropolitan areas, that means dealing with the workplace, where people -- particularly men but often women as well -- spend the vast majority of their waking hours. How does Judaism in general, and halakhah in particular, impact that significant aspect of people's lives? As I was looking recently for a Pesach guide, I came across a short book I once received in the mail titled Nine to Five: A Guide to Modest Conduct for Today's Workplace. The title sounded promising and I was hoping to find a book that deals with how to maintain modest behavior in a business environment that thrives on arrogance. How do you go on an interview without immodestly praising yourself? How do you make sure to receive credit for work you've done without bragging? Unfortunately, the book is limited to male-female interaction. While it is understood that this deals with one of the strongest natural urges in a human being, there is definitely more to the workplace than avoiding improper male-female interaction. That's just a sample. If you follow these rules, you will be so awkward that you will never get a promotion and never close a deal. In a company where everyone is called by their first name and you can go into the CEO who makes 30 million dollars a year's office and call him Larry, is it really a good idea to advise people to call every woman Mrs. Grand or Ms. Crystal? I'm sure that there are a few people with the charisma to be able to handle every situation. But, speaking for myself, I would just end up being awkwardly silent and offending women, who may be my boss or simply someone whose help I will eventually need. In the workplace, you can be faced with complex political situations in which you need all of the allies you can get. Alienating half of the workforce isn't going to help you with that. Nor will it help you to get someone to take on some of your work because you have to leave early for Shabbos. Are there nisyonos (spiritual challenges) in the workplace? Of course there are, and male-female interaction is definitely a significant (but not the only) one. We all need to have appropriate boundaries to help us deal with these nisyonos. But offering unrealistic guidelines doesn't help us; it hurts us. When I read a book like this, I feel profoundly sad. It makes me think that the rabbis have abandoned us. There was once a time when rabbis recognized that people struggle to feed and clothe their families. They considered working to be a devar mitzvah and struggled to find leniencies to allow people to earn a living. And what do we get? Don't shake hands. * Don't make small talk. Don't compliment a woman. Etc. etc. Unrealistic advice does not help us get through our challenges. It just leaves us abandoned, trying to figure it out on our own. No wonder there are many people who fail these challenges. It is appropriate for male and female employees [to] refrain from all conversation when they meet anywhere outside of the office. This includes not discussing even job-related matters when meeting in the hallway or elevator at work. Thanks for the "helpful" idea. Reality: Business is discussed everywhere. In the bathroom, in the hallways, in cabs, and on the street. What do you do if a female colleague (or executive!) starts talking business to you? Or what if she starts making small talk? Or what if she doesn't and you fail to fill that awkward silence. Do you insist that your religion prohibits it? I honestly know of a case in which a woman lost a job opportunity to a less qualified man because she left what was perceived as awkward silences in a particular conversation. And this book is highly praised and comes with glowing approbations from leading rabbis. We need you but where are you? Are we all alone in this? Maybe TorahWeb can give us insight into these issues because they seem like some of the only people making sense today. 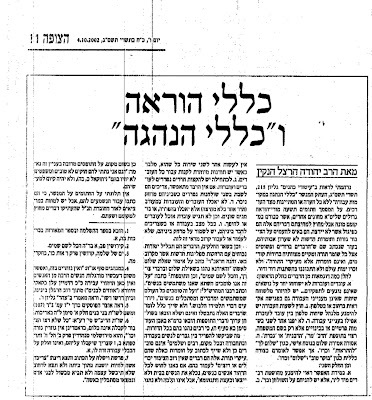 * Regarding shaking hands, see the current issue of Hakirah, where R. Yehuda Henkin permits shaking hands, a position that most rabbis will take in private. When a friend of mine started working, he called R. Avigdor Miller and, despite this friend's hesitations that he was uncomfortable with the idea, was told by R. Miller to shake women's hands.